i've been trying to learn more and more about wpf/e and the current functionality in the february ctp, so i decided to jump on the create-a-video-player-skin bandwagon and mock something up. 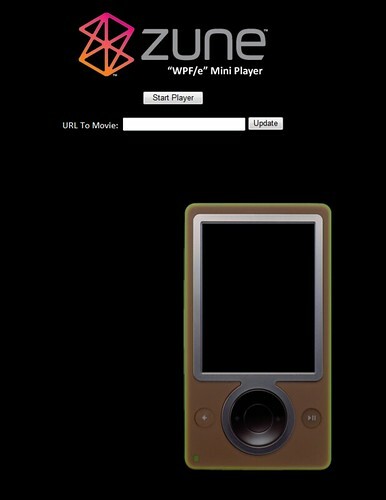 and when you click 'start player' (yes i know it would be cool to show the player as a playlist and use the normal zune buttons, but c'mon, v.0.0.3 here...work with me people) it rotates to show you the video (if you don't own a zune, the player shows videos landscape rather than portrait). anyhow, i'm hoping to evolve this a bit more when i have some more free time -- there is a small bug in the stream downloading calculations that i'm hunting right now. in case you haven't seen the default video playing, it is the red vs. blue of scott guthrie. 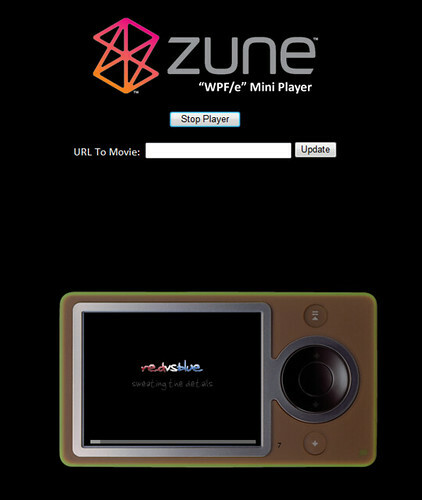 here's the link to my zune miniplayer.